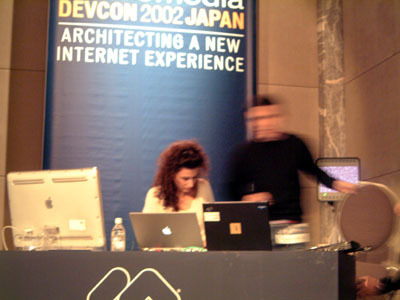 Was “Macromedia DevCon” a bigger success this year? I am not sure about this because I do not participate in this sort of conferences often. However, I can admit that some of the sessions this time were really sensational. 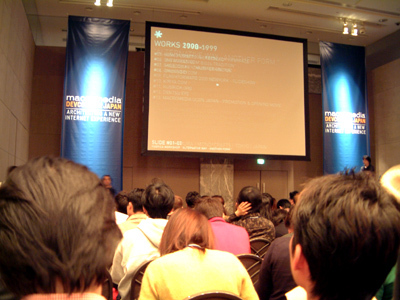 The conference was held for two days, on (Tue.) 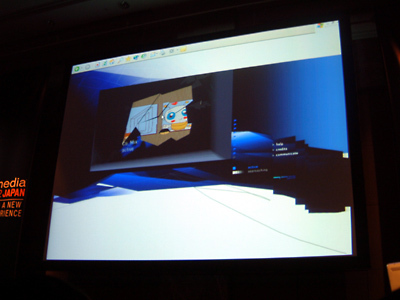 19th and (Wed.) 20th of November at Cerulean Tower Tokyo Hotel in Shibuya, Tokyo. The hotel is one of the newest buildings in Shibuya and it is located between Meiji Avenue and Aoyama Avenue. Shibuya is known as a popular town for young people but the fact, that this area is a bit far from the centre of Shibuya, might be a reason why many young designers and new companies tend to start their business here. The sessions consisted of 40 workshops and 10 hands-on-trainings, and the contents of them were divided into three sections: the session that well-known creators explaining their works, the discussion session about rich media for developers and “Coldfusion”, and the tutorial for beginners applications. The promotional aim of Macromedia “Taking the root of ‘Coldfusion’ tn the Japanese markets” was really clear to understand. More than half of the events for developers took “Coldfusion” in some new ways. This server side application is not known well in Japan compared to overseas but it seems to be popular in the Japanese markets with the diffusion of the MX series. 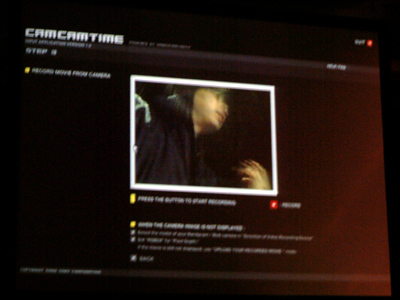 As for the sessions for creators, Image Dive, Yugo Nakamura and Hi-Res! had speeches on the 19th. The presentation of Mr Yugo Nakamura was about his works since 1999. I felt his works are getting bigger and no longer can be in the narrow category “web designing”. His interest now goes to “the immediate future’s communication and interface as they ought to be” and they sometimes can be just “a study” as well as “fruition” as a “CI”-like-project such as Sony’s “Connected Identity”. At any rate, it was certain that he is dealing with jobs as targeting more than “web” and “design”. The session of Hi-Res! was also interesting. I personally got beautiful vector-based motion images like Jump Tomorrow and The Third Place. However, they showed various works from the early days’ to alternative tested sites, such as Donnie Darko and I was surprised with their wide range of talents. The comment they repeatedly said, “The most important thing is an idea. Not an ostensible design” strongly stayed within my head. IMG SRC, Mr Shinzo Fukui and FuriFuri Company appeared as speakers on the 20th, but I could not listen to their sessions unfortunately. There were many audiences and the sessions seemed to be exciting as well. However, (this is what I always think when I go to this kind of conference) the outside of the session place was always full of crowds who were waiting for the next session. It was a shame that there were not many spaces where people could comfortably sit down to have a chat.